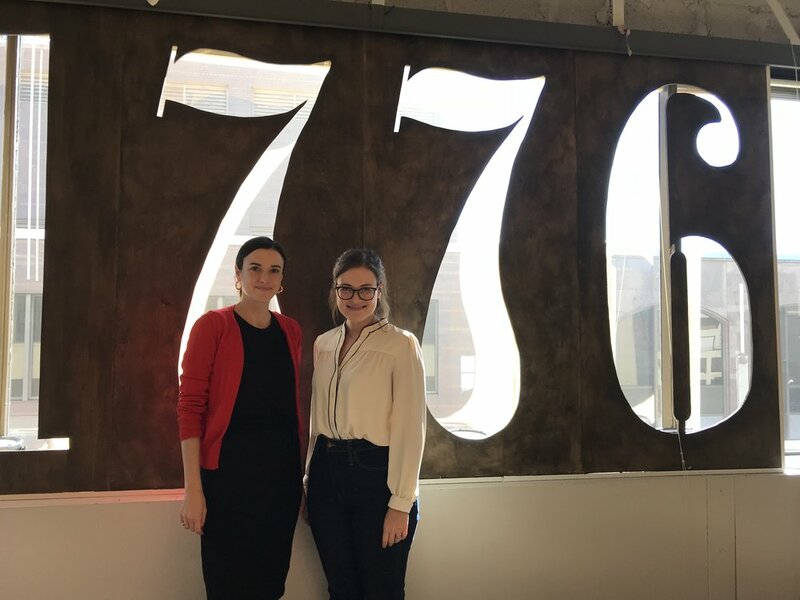 Bold Type took a field trip to City Center last week and spent a morning at 1776 DC, a local network for startups. We gathered with other DC entrepreneurs for an event sponsored by 1 Million Cups, which has chapters in cities all around the country. Each month, 1MC invites people to chat over coffee and crowdsource solutions for a particular startup. Last week, the founder of a new sustainable pet food startup called Chippin presented on the company’s line of snacks for dogs made with cricket protein (yes, you read that right!). Chippin’s current challenge is to increase brand awareness in the DMV area ahead of their official product launch in November. After a pitch presentation, the twenty or so networkers—representing diverse industries and business models—put their heads together to suggest ways Chippin can get the word out about its product. Chippin and Bold Type may have little in common (other than a love for pups), but we were struck by a number of concepts the group raised. Writing feels different when it’s for a broad audience. Several people mentioned what a challenge it is to “write for people.” We all instinctively know there’s a difference in writing for internal communication versus outward communication. The way you write emails matters (don’t get us started! ), but it feels a lot weightier to write on behalf of your company to your entire client base. Everyone from interns to visionary CEOs feel the weight of telling the company story in writing. Sharing your challenges is the best way to eliminate them. Telling people what you or your business is struggling with doesn’t make you weak; instead, it’s the quickest way to get help. We run into this all the time with professionals. They don’t want to draw attention to their weaknesses as writers, so they attempt to mask them with fancy words and stiff, complicated sentences. No. Acknowledge the things you struggle with, ask for help, and commit to turning them into strengths. It’s a sign of progress to pivot and change strategy. An agile, adaptive business is a successful business. This is true for professionals, too. Frustrated when the rule changes from two spaces after a period to one? Sure you are, but you adapt and move on. Embarrassed when people start replying to your emails with a simple TL;DR? Totally understandable. But you have to change with the times and get with the program. We love learning about the writing goals and challenges of other entrepreneurs and professionals. One thing we can say for sure is that some writing tasks are just plain harder than others—but every one involves measurable skills that anyone can master.